Apache Spark is an open-source framework for performing general data analytics on distributed computing cluster, with libraries for machine learning, interactive queries and graph analytics. 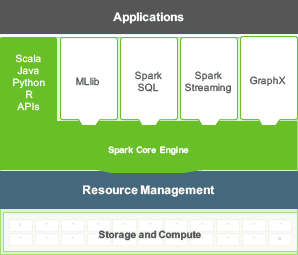 Sporting a multi-stage RAM-capable compute framework, Spark’s real-time data processing capability is considerably faster than Hadoop’s MapReduce. Spark consists of Spark Core and a set of libraries with user-friendly APIs for Scala (its native language), Java, Python, and Spark SQL, making it is easier to use than Hadoop. It can run on a Hadoop cluster with YARN but also Mesos or in standalone mode and works with a variety filesystems such as HDFS, MapR File System, Cassandra, OpenStack Swift, Amazon S3, Kudu, etc. offers Scala’s compelling features for statistical computing.